This title includes comprehensive advice on materials, canvases and equipment, and on using all the different types of media including pencil, charcoal, pastels, oils, acrylics and watercolour. It features a stunning gallery of art with accompanying commentaries giving insight into how the artistic techniques have been used by professional artists. It also includes an useful tutorials section on the technical aspects of drawing and painting the human form, from measuring and proportions to portraying movement. It is beautifully illustrated with over 400 step-by-step photographs to make it easy to follow each exercise and achieve fantastic results. 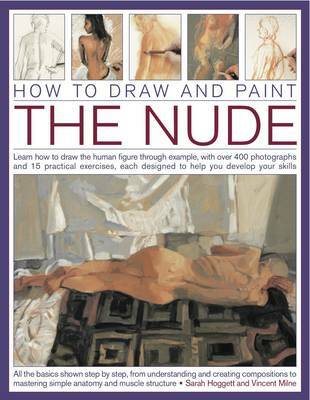 This book provides a comprehensive and detailed guide to drawing the human form. It offers budding artist to take step-by-step lessons from an expert tutor and learn the art of drawing and painting the human figure. A detailed tutorials section sets out the technicalities of life drawing, touching on very simple anatomy for the artist as well as on more artistic concerns such as props, composition and lighting. A gallery of works by professional artists follows the tutorials, which you can use as a source of ideas and inspiration, this beautiful book is an easy to use guide that will help you master one of the most popular art forms of our time.